NEW DELHI: After failing to form a pre-poll alliance with the Mayawati-led Bahujan Samaj Party for the upcoming assembly elections in Madhya Pradesh, the Congress is now holding talks with a fledgling tribal political outfit called Jai Adivasi Yuva Shakti (JAYS). JAYS convenor Dr Hiralal Alawa told Press Trust of India that his outfit has sought 40 seats from the Congress as part of the pre-poll alliance in Madhya Pradesh, which has 230 assembly constituencies. “The Congress is in talks with us for an alliance. Our focus is on 28 seats in the Malwa-Nimar region of western Madhya Pradesh that has 66 assembly constituencies. Out of these 28 seats, 22 are reserved for tribals. Congress currently has just five of these 22 seats” he said. Dr Alawa, a former assistant professor from Delhi’s All India Institute of Medical Sciences (AIIMS), says that JAYS intends to field candidates in Alirajpur, Ratlam, Jhabua, Dhar, Khargone, Burhanpur, Khandwa, Dewas and Barwani districts in western Madhya Pradesh as they have a sizeable tribal population. “We have already shown our strength by holding a Kisan Panchayat in Kukshi in Dhar district on October 2. 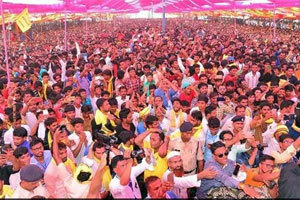 Over one lakh tribal youths took part in it,” he claimed. Kukshi happens to be a Congress stronghold. The party has lost the seat only twice in the past 60 years – in 1962 and 1990. It was the constituency of one of the tallest tribal leaders of the Congress in Madhya Pradesh – Jamuna Devi – who deputy chief minister and leader of the opposition in the state. When contacted, a state Congress leader confirmed that the party was negotiating with JAYS for a pre-poll alliance. Out of the 230 constituencies in Madhya Pradesh, 47 are reserved for candidates belonging to Scheduled Tribes. In the 2013 assembly election, BJP had won 31 of these seats and Congress won 15. The Thandla seat in Jhabua district was won by an independent candidate. The Congress was reportedly in touch with another tribal party – the Gondwana Gantantra Party (GGP) – but the alliance didn’t work out. The GGP has been there in Madhya Pradesh’s political scene since 1991. Though also a tribal-based party, JAYS won’t be competing for the same base. While GGP’s influence is largely in the Eastern and Southern districts of Madhya Pradesh like Seoni, Mandla, Shahdol and Satna, the JAYS’ main focus is on the western part of the state. If the Congress and JAYS manage to form an alliance, it would be a repeat of the experiment in Gujarat. In last year’s assembly elections, the Congress had aligned with a newly formed tribal outfit Bharatiya Tribal Party led by Bhil leader Chhotubhai Vasava. The alliance was successful as the Congress and BTP won 17 out of the 27 seats reserved for Scheduled Tribes in Gujarat, with the BJP winning just nine.